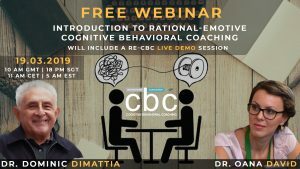 Cognitive-behavioral coaching is currently the most evidence-based approach to coaching, in the same way, that CBT is the golden standard approach in psychotherapy. But what are its main theoretical assumptions? How are the two different? How can the cognitive-behavioral theory be used in coaching? Is it effective? Is it easy to implement? Is it suitable for you? Our upcoming webinar will offer you answers with founding experts of the field, Dr. Dominic DiMattia and Dr. Oana David, to these and many and other related questions. This webinar was designed to introduce you to the basics of CBC. The first part will consist of a discussion between the two experts on the roots of RE-CBC, its main theory, and applications. The second part will offer you a Live RE-CBC demo session on how it can work. This is a free giveaway for our members and any student or professional around the world interested in this field. Register now to save your place at the webinar!